SYRIA – The icon of the “Mysterious Supper” returns to the Syrian village of Maalula. Maalula – A copy of the icon of the Mysterious Supper – stolen from the shrine of St. Sergius and Bacchus in Maalula in 2014 when the Syrian village was occupied by al-Nusra jihadists – has been relocated to the ancient altar. 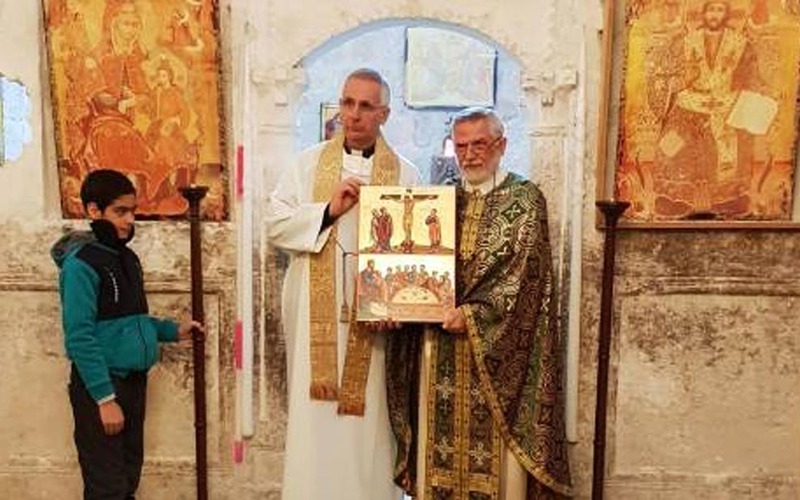 The initiative to have a faithful copy of the icon painted and brought back to Maalula was inspired and brought to completion thanks to the collaboration that involved the NGO Perigeo, the Zaccaria Institute of the Barnabite Fathers of Milan and the University Center for the international solidarity (CESI) of the Catholic University of the Sacred Heart. The icon – symbol, explain the architects of the initiative in a statement sent to Agenzia Fides, “returns to reunite the Syrian Christian community, to testify that the violence of terrorism can only strengthen the identity of those who believe in peaceful coexistence”. During their visit to Syria, the leaders of the institutions involved in the initiative, also delivered a reproduction of Our Lady of Providence, donated by the Barnabite Fathers to Mar Ignatios Aphrem II, Patriarch of the Syriac Orthodox Church, along with some contributions for initiatives and projects to support groups of young people in Damascus, Maalula and Aleppo. The delegation was also able to visit the city of Homs, and also made contact to launch a series of activities in favor of the Syrian people, “which calls for recognition and attention” in a delicate phase, characterized by the need to support the reconstruction and national reconciliation after the devastating years of the conflict. In the original icon of the Mysterious Supper (of Syro-Palestinian workmanship – as well as in its reproduction, the double representation of the Crucifixion and of the Last Supper is represented: the upper part represents the crucified Christ with the holy Virgin and the apostle John, the beloved disciple, while the lower half shows a representation of the Last Supper in detail: Jesus, instead of being at the center of the scene, is on the left side of the table, in the position of “he who serves”. And the table surrounded by Jesus and the apostles is represented with a semicircular form, similar to that of the central altar of the church (which is actually an ancient pagan altar adapted to the cult of the Christian mysteries in the first centuries followed by the birth, death and resurrection of Christ.